The Waldorf Astoria hotel is one of the most famous and well known hotels in Manhattan. This luxury hotel sits right on Park Avenue in Midtown, and is rich full of history. When in opened in its current location in 1931, it became the tallest building in New York. The famous Waldorf salad was invented at the original hotel back in 1896 by Oscar Tschirky, the maître d’hôtel (dining room manager). This simple salad, which at the time only consisted of apple, celery and mayonnaise, became a huge hit. It has transformed over time, and now typically contains walnuts as well. Countless celebrities and dignitaries have stayed or lived at the Waldorf Astoria. In fact, every U.S. president since Herbert Hoover has either stayed in or lived at the Waldorf’s towers. The presidential suite currently goes for $7000 a night. This one-of-a-kind suite is filled with items donated by past presidents – everything from Kennedy’s rocking chair to Regan’s gold oval mirror. Can you imagine what it must be like to stay in that room? Well, we didn’t stay in that room, but we did actually get to stay at the Waldorf Astoria. I had a wonderful privilege of attending a work event hosted at the Waldorf Astoria a few weeks back. It was a great opportunity to explore and experience this historically rich hotel. The Judge’s Dinner is a huge event, but the Waldorf Astoria is a huge hotel and has a beautiful ballroom capable of hosting such events. For the dinner, we sat in one of the upper levels overlooking the center stage, similar to the people you see in the photos on the lower ledge. Esteemed judges sat in the front as Mario Cuomo, the 52nd Governor of New York State, gave a speech. The food was only OK – I guess it’s hard to feed thousands of people at once and make spectacular food. Though I was a little shocked that all the desserts had a piece of gold on top. I mean, how much gold did they have to use to feed so many thousands of people? Must have been several grams or maybe even kilograms! 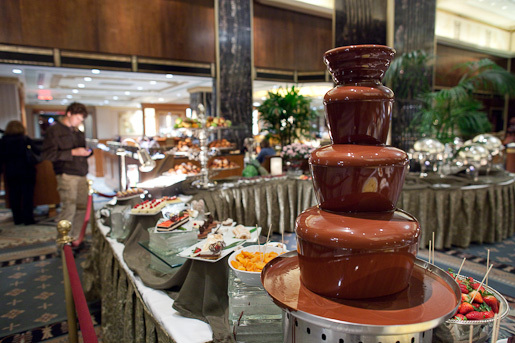 The Waldorf Astoria does hold a spectacular Sunday brunch for $100 per person (yikes!). Although we did not actually try the brunch, Bryan managed to snap a few photos of it while I was checking out of the hotel. Look at all those tiny cups full of fruits, salads, and other interesting dishes. I bet they have Waldorf Salad! And my favorite, the ginormous chocolate fountain. I guess it’s not every day you get to go to a black tie event at the Waldorf Astoria, so we had fun with it. I even went and got my hair done. I’m pretty sure the last time I did that was at my wedding, which is too many years ago! Wow! Aren’t you just living it up! Looks amazing!